In recent years nanofabricated mechanical oscillators have emerged as a promising platform for quantum information applications. Quantum entanglement of engineered optomechanical resonators would offer a compelling route towards scalable quantum networks. Researchers at the TU Delft and the University of Vienna have now observed this entanglement and report their findings in this week’s edition of Nature. Vibrations behave like waves, but quantum mechanics also predicts that this motion consists of tiny discrete packages of energy, called phonons. In September 2017, the team of researchers at the TU Delft and the University of Vienna already demonstrated a new level of quantum control over these vibrations using laser pulses. They created individual phonon excitations and confirmed their fundamental particle aspect. The creation and verification of these single phonons was an important step towards full optical quantum control of mechanical motion. The devices used consist of micrometer-sized silicon beams. They are patterned in such a way that their vibrations can be ‘written’ onto laser pulses traveling through them and vice versa. The vibrating beams consist of eight billion atoms each, have the size of a small cell and can therefore easily be seen in a magnifying glass or microscope. “Nanomachined optomechanical devices are a very promising platform for integrated quantum information processing with phonons, as the parameters of the system, like optical conversion wavelength and quantum memory times, can be freely tailored through the design. For example, we deliberately chose the optical wavelength of the device to be in the telecommunication band, which is typically used in the distribution of high bandwidth internet. Thereby we show that quantum networks could be constructed just using conventional fiber optics in combination with our devices”, says dr. Sungkun Hong from the University of Vienna. Another key advantage is that their devices can be integrated on a chip together with other solid-state quantum systems. 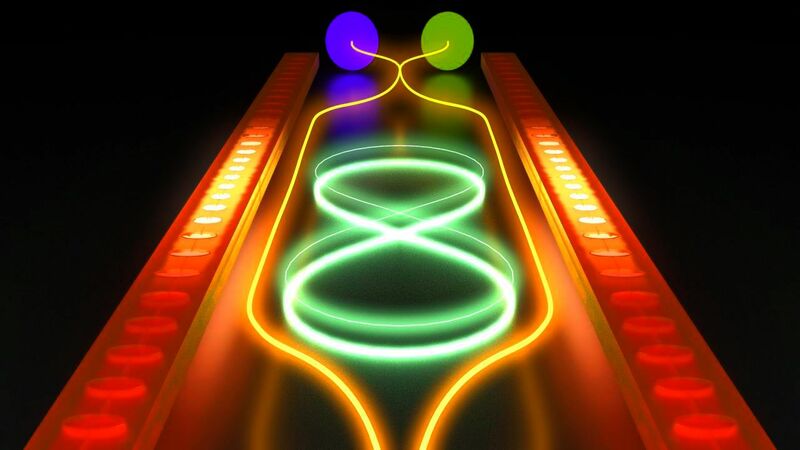 The authors, for instance, expect that their devices could potentially be interfaced with superconducting quantum circuits and used as quantum ‘ethernet ports’ that transfer quantum information between the circuits and optical signals. Artists impression of two mechanical oscillators that are brought into a quantum entangled state through a light field inside an optical interferometer. The two systems exhibit stronger than classically possible correlations, often referred to as spooky action at a distance. This demonstration of entanglement between engineered systems could help to directly realize a quantum network. Credits: Moritz Forsch. Kavli Institute of Nanoscience, Delft University of Technology.